One thing that has left me (and my clients) scratching our heads over is removing custom reports from the MAS 90 and MAS 200 menu structure. Like bad house guests, these user created reports are easy to add (Library Master – Setup – Report Manager) — but nearly impossible to get them to leave when you want. Unless someone has discovered a better way, here’s the solution that I’ve used in the past to remove custom reports that have been added to the Sage MAS 90 and MAS 200 menus (these are the reports that show on the Custom menu choice). UPDATE/CLARIFICATION: These instructions are meant for situations where you cannot remove a Custom Report via the Report Manager menu. Normally you can go into the Report Manager menu and click the “X” when you have a custom report selected. In many situations (that I’ve seen) this red “X” either is not present for selection or once clicked does not work. That is what the instructions below are meant to cover. Important: Backup your entire \MAS_SYSTEM and \SOA folder before making any changes. I take no responsibility for any damage that may occur on your system. This was tested on version 4.2 and may (or may not) work similarly on earlier and later versions. Browse to the record which is showing your report and click delete. The process to rebuild your Sage 100 menus has changed depending upon the version of Sage that you are using. 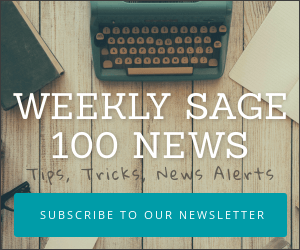 For current instructions see – how to rebuild Sage 100 and Sage 100cloud menus. Found a better way out of this situation? Let me know in the comments below.